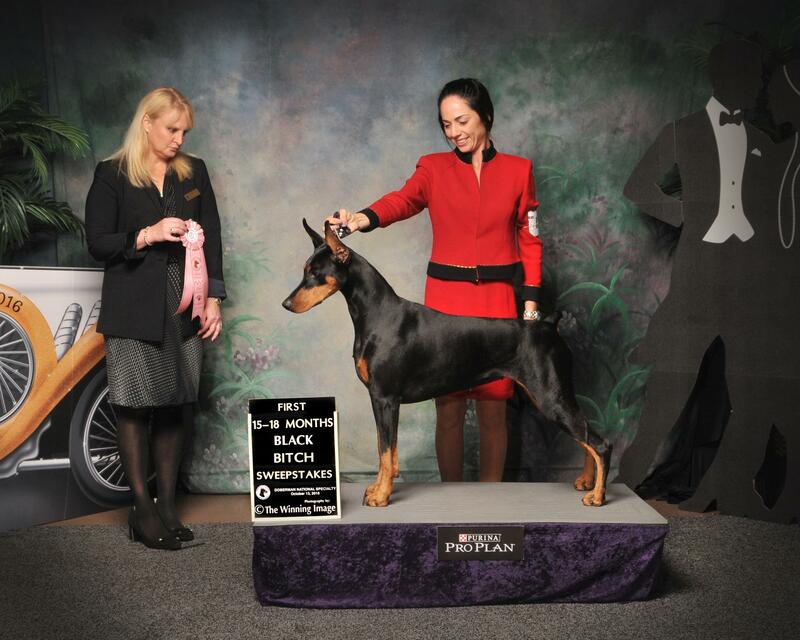 Lola- Caleb's Intriguing CGC CGCU RATN - GCH Element RockStar x CH Caleb's Redemption. Owned with Cindy List. Shown by Amber List. she has been spotted modeling for a National magazine. Who knows where we will see her next. Reagan - UKC CH Caleb's Unwavering CGC - GCH ELement Rock Star x CH Caleb's Redemption. Owned with Betty Cox. Reagan has 5 AKC points. Owned with Barbara Moyer and Nancy Young. Ryder also is titled in Freestyle Dancing! 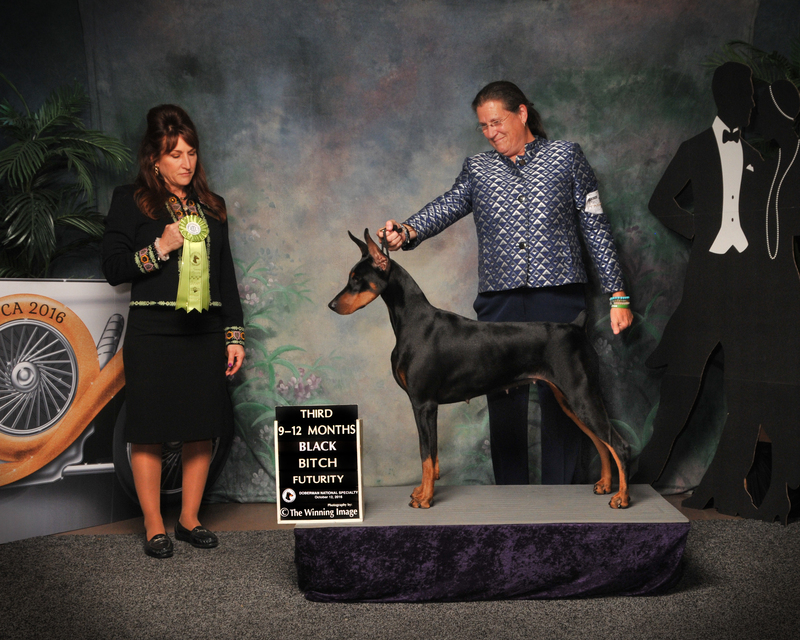 GLORY- New CH Caleb's Morning Glory v Marywyck finished with 3 majors at 11 mos. Simon shown winning Group 1 shown by owner Sarah Heinemann Macek DVM. 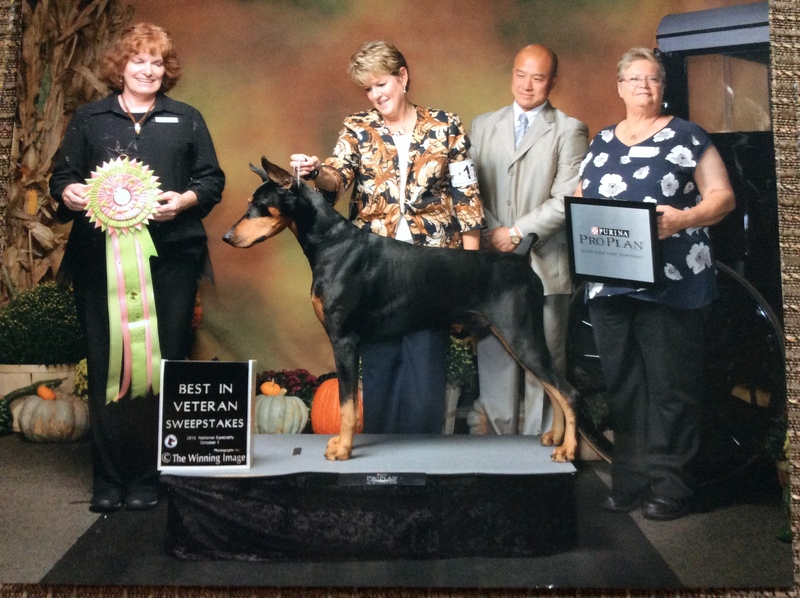 Simon had an amazing trip to his Grand Championship all owner handled. He started the year with 3 single points. In only 3 weekends of showing in conformation this year he picked up 4 Best Of Breed wins and 1 Select Dog win for 4 - 5 point majors and 1 - 2 point win. 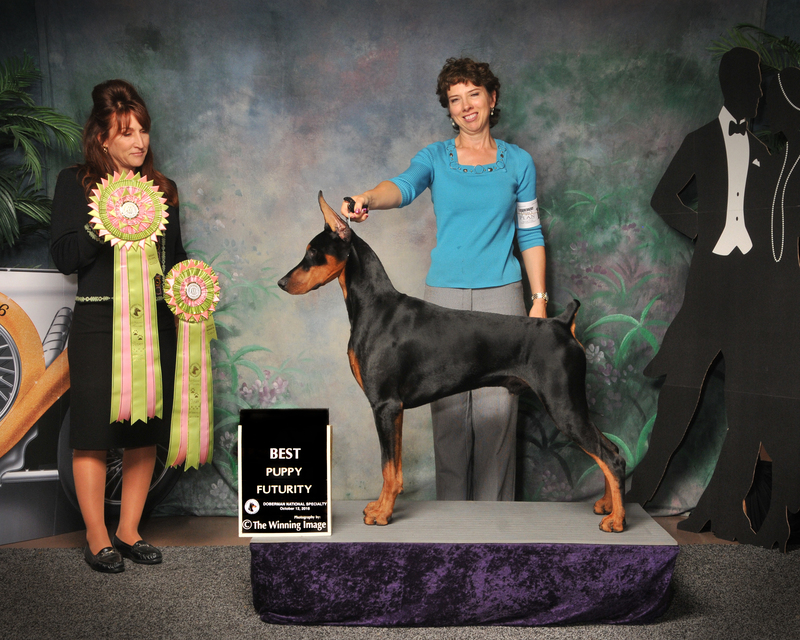 He won a Group 1, 2 - Group 2s, and an Owner Handler Best In Show along the way. "Simon" is by GRCH.Marywyck's Thief Of Hearts x Caleb's Divine Providence. Now that Talia has finished her championship she is enjoying a Sport she clearly loves-Dock Diving! This is Raven - UKC CH Caleb's His Eye Is On The Sparrow CGC BN RN WAC owned by Pam and Jack Scheid. 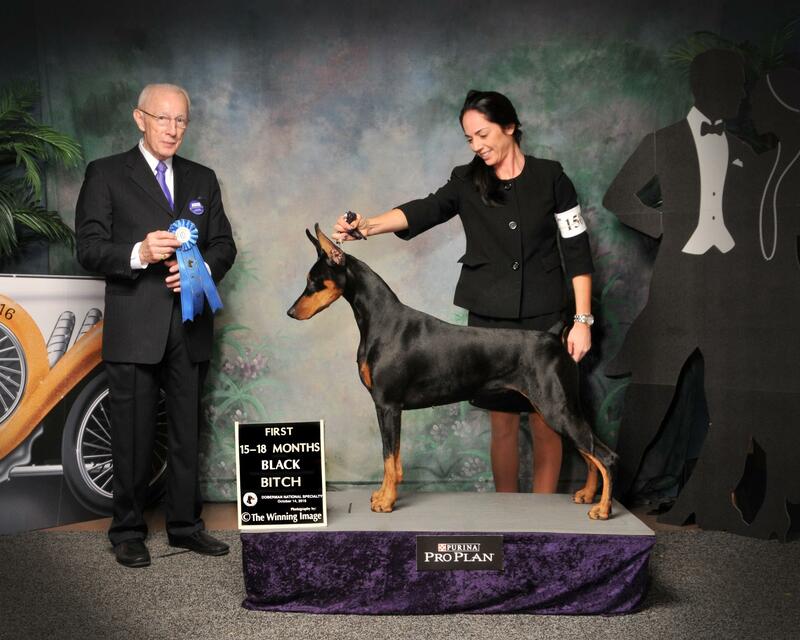 Raven had a GREAT 2015 Nationals she got 3rd in Am-Bred Black, finished her Novice B Obedience Title,got her Rally Novice Title and her Working Aptitude Certificate.Congratulations Pam and Jack for all your hard work paying off !!!!!!!!!! Raven got her Novice B Obedience Title at the Nationals owner-handled by Pam. What a talented team!!!!!!!! 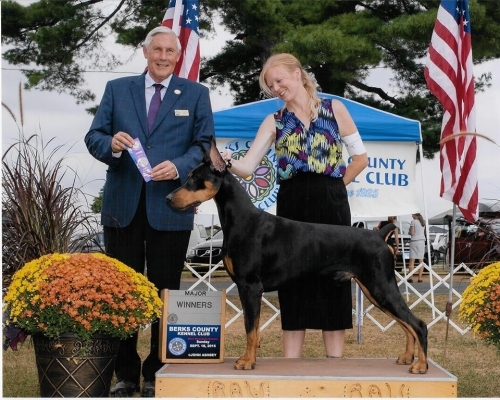 Bart won Best Veteran in Sweepstakes at the 2015 Nationals from the 9-11 class.He also grabbed three third place Agility wins there , at the age of 9 1/2. So proud of him and Bill!!!!! 1/26 &27/ 2013,Bart is now:Ch Caleb's Celtic Cross CD RA MXJ MA MXP ROM. Elijah came out of retirement for a few months to get his Grand Championship. GCH Caleb's Chariot Of Fire owned by Gillian and Joe Hill, Finished his GCH on 8-23-14 at Newtown KC , Springfield,MA. 3 BOSs ,and 6 majors at six years of age.